It’s that time of year again! Nevada Association of Employers is currently collecting data for our annual Nevada Pay Survey. NAE encourages all Nevada businesses to participate in our annual pay survey. Whether you are in the Reno/Sparks area, Las Vegas, Carson City, or Elko, your pay data is important to us. Your pay data helps us determine what businesses throughout the state are paying their employees. You do not need to be a member of NAE to participate. We accept pay data from all Nevada businesses. 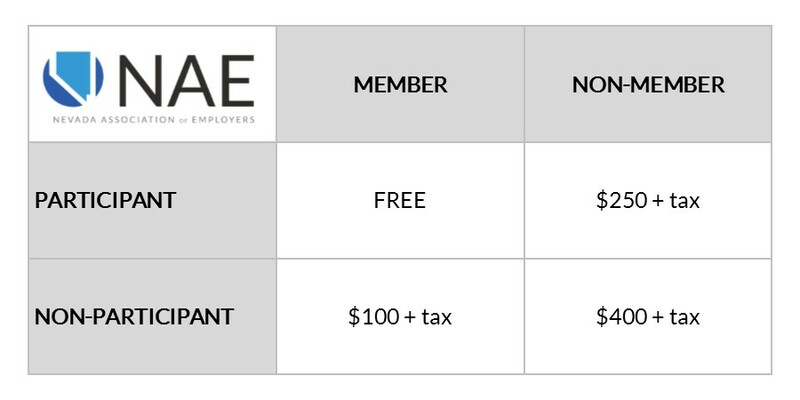 However, there are benefits for being a member of NAE and participating in our annual pay survey, including a significant discount on the pay survey results. For organizations who participated in the 2018 Nevada Pay Survey – GREAT NEWS – all data you entered and saved last year is already in the system. All you have to do is update your data for 2019 and add any new job titles, pay information, etc. NAE members and past non-member survey participants will receive an email in the coming weeks with login credentials for their organization and instructions for completing the survey. Want to get a head start? Download the survey instructions and job descriptions to get started. Never participated in our annual pay survey before? Interested in participating? Contact us at surveys@nevadaemployers.org or (775) 329-4241 for more information and to get login credentials for your organization. Don’t procrastinate. Submit your pay data today! All pay survey data must be entered on or before May 15, 2019 to be included in the 2019 Nevada Pay Survey. Need assistance completing the 2019 Nevada Pay Survey? Contact us at surveys@nevadaemployers.org or (775) 329-4241. The results of the 2019 Nevada Pay Survey will be published in July 2019. Can’t wait that long? You can purchase a copy of the 2018 Nevada Pay Survey results. NAE members who participated in 2018 can access the 2018 Nevada Pay Survey results (and our custom reporting tool) for FREE online (login required). Not sure if you participated? We can help you with that! Contact us at surveys@nevadaemployers.org or (775) 329-4241. Looking for employee benefits and personnel practices data? Purchase a copy of the 2017-2018 Benefits & Personnel Practices Survey. The cost of the survey results will be based on the fee schedule above.